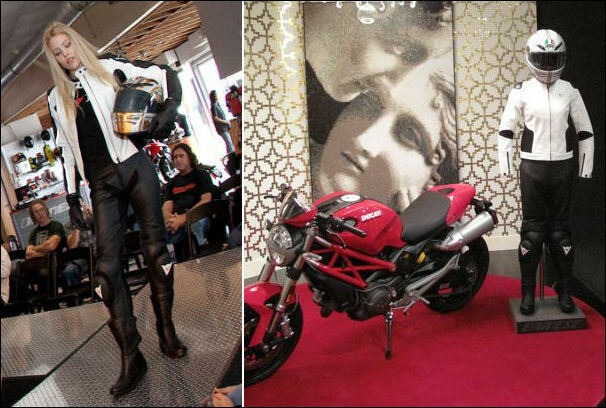 Dainese may have been developed for professional motorcyclists, but their leather jackets and pants are not just for the Harley lovin’ crowd. New to the U.S., this popular Italian line is a must-have for self-proclaimed fashionistas and for the men in their lives. Think Angelina Jolie and Brad Pitt. 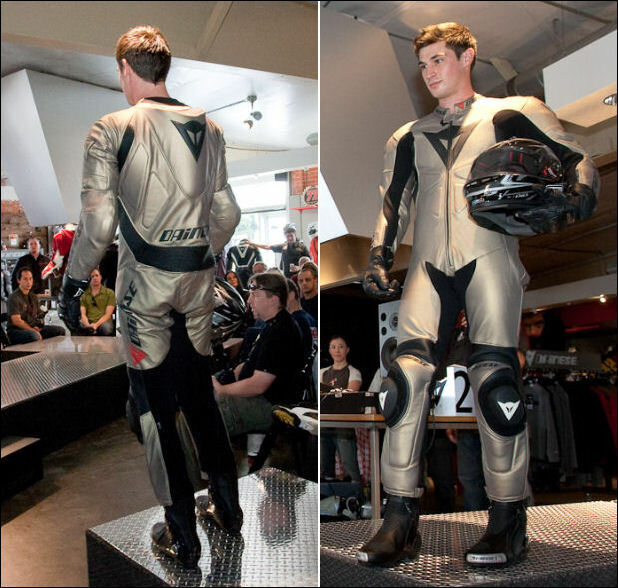 Dainese recently transformed their Costa Mesa, California store into a runway where models showed off the latest looks from the 2009 collection. 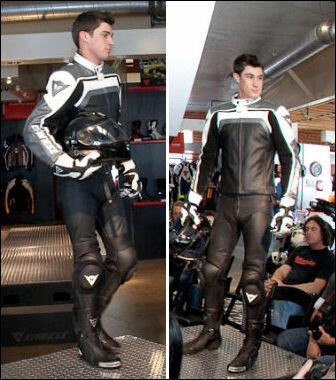 In addition to leather jackets and suits, the line consists of jeans, t-shirts, AGV helmets, riding gloves, shoes and bags. Go classic in black and white. The SF Lady jacket (left) and the Dominia jacket (right) has the look of a sporty men’s jacket but tailored for a woman’s body. 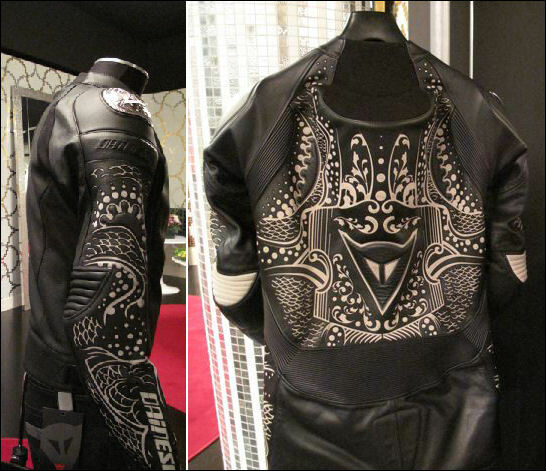 The Tattoo Ykz leather jacket and suit is the star of the collection. You may just have to rename this the boyfriend jacket— buy it for him and then borrow it for yourself. He’ll look perfectly relaxed in the Gran Premio Textile jacket, Toronto jeans, and Shift shoes on casual Spring days. And when he’s ready for a ride, he can just throw on the gloves and AGV K3 helmet in evil blue and he’s ready to go. Yes the boyfriend jeans are in this season, but the Toronto jeans also come in women’s sizes, so you won’t have to borrow his. No outfit is complete without shoes! Wear these Lola Lady boots over black leggings or with a mini dress. 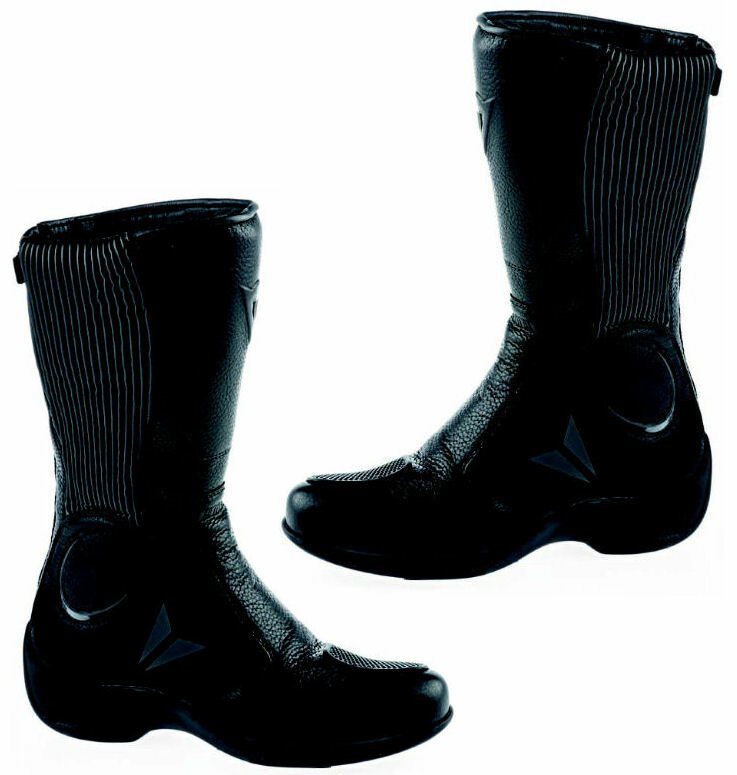 And the best part is that they’re comfortable– they’re specifically designed to fit the outline of women’s feet and the inside is lined with Gore-tex® to keep the feet cool and ventilated. If he’s looking for attention, no doubt he’ll get it in the Rapture jacket. 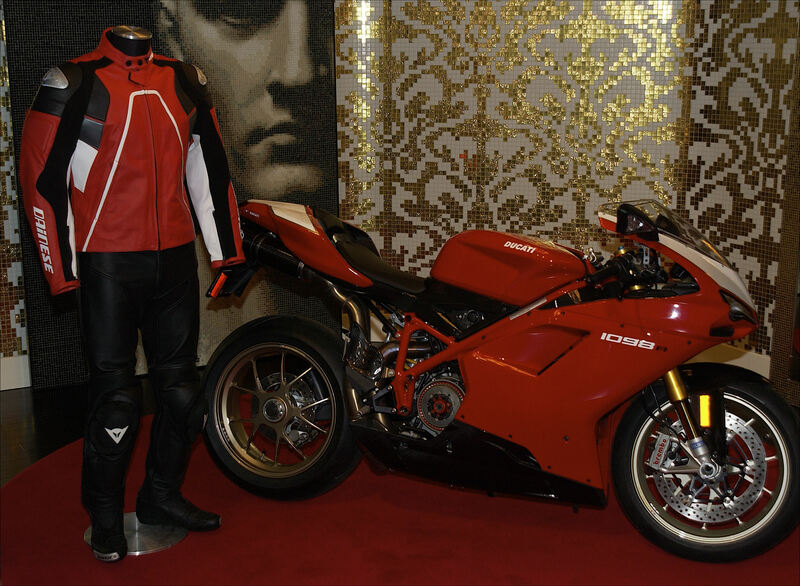 The color combo and design scream “look at me” and as soon as he jumps on this red Ducati bike, heads will definitely turn. If you’re looking to get into the sport, you’ll need the right outfit. Pictured above is the Dominia suit in white, Torque Out boots in white, Steelt Lady gloves in black, and AGV GP-Tech helmet in white and blue. If you love this Gran Premio jacket for him, then you’ll be happy to know that they have a version for us girls. Next time he goes for a ride, throw yours on and make it a date. There’s just no mistaking the Dainese logo with other brands. The Los Angeles Bisazza store created the logo in different colors using their mosaic, which Charlize Theron and Simon Cowell are fans of. For the serious rider, the new version of the Laguna Seca professional suit has a special system that contains a water bag, which holds up to 500 ml, with a tube fitted to certain Dainese helmets that connects the spoiler to the rider’s mouth, perfect for even the hottest days.